A little more than five years ago, we published a plug-in that allowed you to submit code directly from Visual Studio to The Daily WTF. However, in the years since, that style of extension was deprecated in Visual Studio, and the SubmitToWTF API was lost in the latest site redesign. The loss was felt by many users. Without the plug-in, submitting bad code requires first printing it out, putting it on a wooden table, taking a picture of it... then printing out the picture, scanning it, then uploading as a PDF to the Submit Your WTF form. With Christmas right around the corner, we thought it would be the perfect time to restore this much-needed plug-in. Thanks to Ben Lubar, the SubmitToWTF extension has been rewritten and is available directly from the Visual Studio Marketplace. Because it's in the marketplace, you can simply install the extension from within Visual Studio (tip: search "wtf", not a whole lot comes up), restart Visual Studio... and voilà! 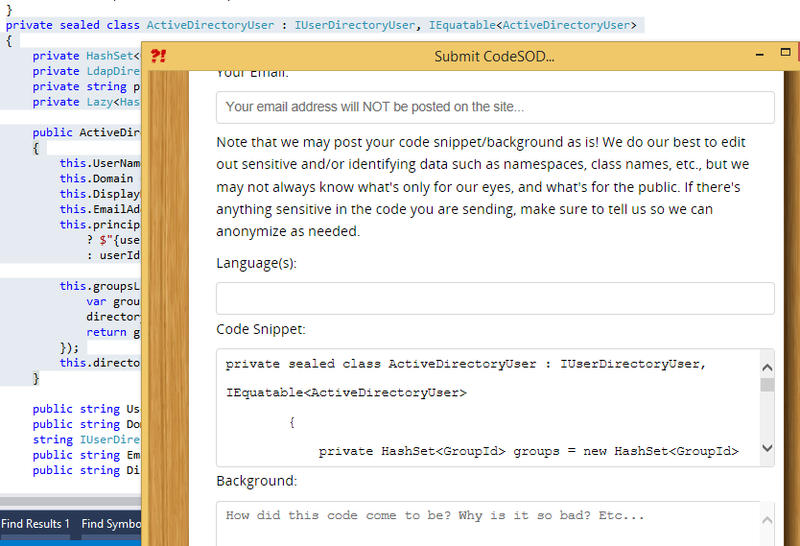 You can once again hilight offensive code and submit it without ever leaving the comfort of Visual Studio.